Placed an order for 2 v6 E3D hotends yesterday, so just want to prepare what I can now. Thought I'd create this thread to document it all. I'm also desperate for help with how to mount them. I have no clue where to start, or how I'm going to make it happen, just that I'm GOING to make it happen. So would definitely appreciate any help with that, wherever I can get it! I took a look at how some of you guys have mounted dual extruders, but I think it'll make more sense when I have them in my hands. I guess they're just held up by that groove, rather than by a bolt like the stock hotend. I also ordered a stepper and will be ordering another EZStruder kit, or I don't know, perhaps make one myself, if I can find the right spring. For now, I've modified the stock mount, what do you guys think? I think that it should work great. Great design work! Thanks! I was lucky that the DWG of the lasercut parts are available. 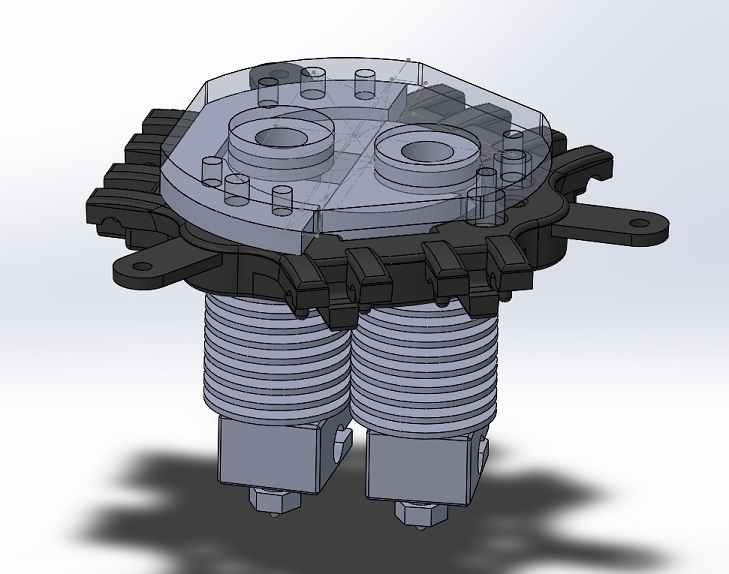 Was able to take that into Solidworks and play around with it for a bit until I got what I wanted. I think I'll build those little wedges (spacers) directly into it. 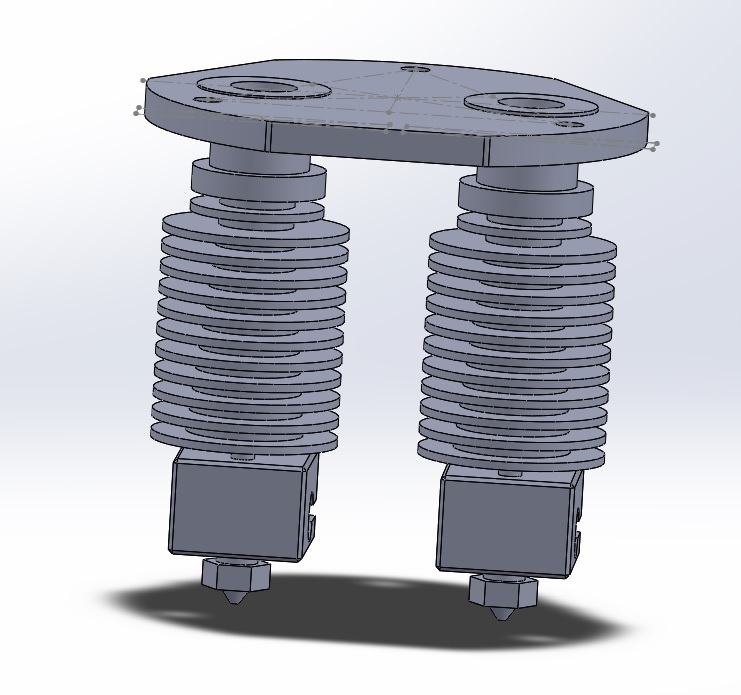 I was also able to find the right compression spring used in the EZStruder, so I'm going to try to make my own. Should be a fun experiment, and if it doesn't work then I'll just order one. Need an R2ZZ bearing and I'll just need to order the hobbed roller. atoff wrote: Thanks! I was lucky that the DWG of the lasercut parts are available. 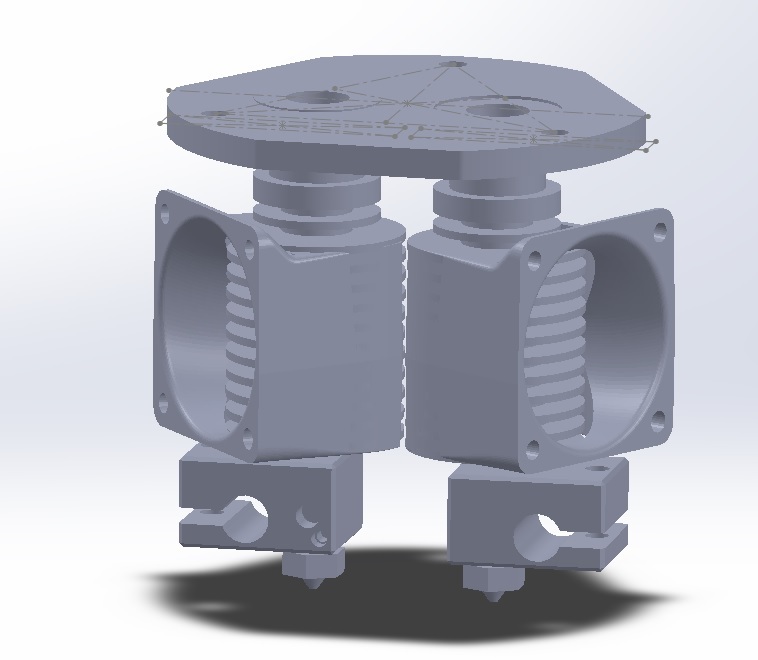 Was able to take that into Solidworks and play around with it for a bit until I got what I wanted. I think I'll build those little wedges (spacers) directly into it. I was also able to find the right compression spring used in the EZStruder, so I'm going to try to make my own. Should be a fun experiment, and if it doesn't work then I'll just order one. Need an R2ZZ bearing and I'll just need to order the hobbed roller. Good attitude! Why buy em when you can make em! I call it... the Uglystruder! It's...functional, sort of. I haven't tried installing it yet. It was a test print to see how it would come out. I basically just used the STL's available without modifying them. I really need to figure out why my prints are coming out so horribly ugly. I tried printing this thing several times more, but they all failed. It's the bottom part that fails. The base, the cover, the arm, these print fine, albeit not very nicely, considering the mess left behind from the supports, but I think I can get it functioning enough to where I could use the dual extruders to print it again with a dissolvable support. Not sure, my trigger finger is on the "Check Out" button in the SMC shop. It really doesn't look that bad. It is awfully close to looking like it could work but I have no idea what is needed to actually make it work. No, it's not actually TOO bad... just a little rough around edges. 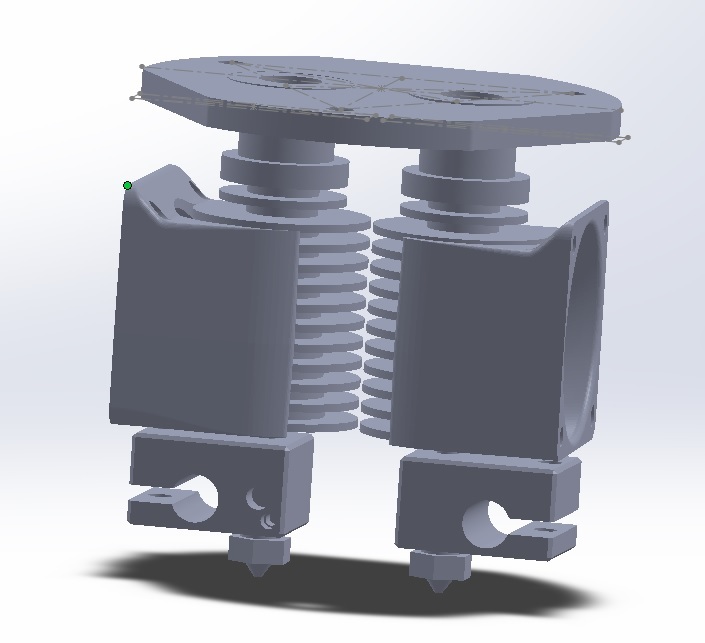 The arm / lever is very restricted, but I'm sure I could take it into Solidworks and loosen it up a bit. The parts are a bit expensive, due in part to shipping cost, so I wouldn't be saving too much going the DIY route. I need the bearings, $5 from China (5-15 days shipping), springs (~$11-16 for a pack of 10), can't find them individually, or cheaper than that unfortunately. Then I need a hobbed gear (~$9 for an MK7 extruder gear on Ebay). So about $25-30 shipped. $42 shipped for the EZStruder for SMC. Granted I'd have parts left over to make more, but I can't see myself ever needing another... not for a long while at least. I've started working on the mount for the E3D's... was wondering if the spacing I have is too far apart. I wanted to be able to use the included injection molded fan shrouds, so had to space them quite far from one another. 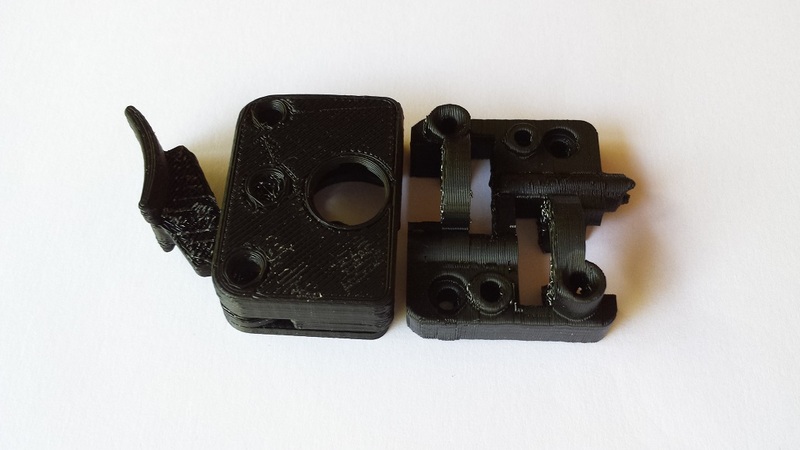 I was looking at bubbasnow's mount for the v5's (http://www.thingiverse.com/thing:278076), where he has his smack next to each other (which is probably best), but with his own fan shroud. Oh, good thinking! I didn't think of that when mocking it up. Yeah, I think that would be a great way to do it, by placing the fans on opposite ends, thanks! So, do you think there would be a need to have one of the hotends height adjustable by a small amount? Should I go through the trouble of designing that? I don't have experience with dual mounts, but it sounds like one of the frustrations is with leveling them. I was thinking if I mount one that's completely stationary, I would only need to make one capable of rising up and down by a very small amount. the way i handled nozzle difference was shimmed the low side until even. it was hard with the 3 hole design, so if you add one and use 4 of the 6 holes you can evenly shim. I would point the fans opposite of each other but not blowing into each other. Yup, they'll be at an angle to one another... something like this, but rather on the other side. I need that front side for the layer fan I'm trying to work out. I was thinking about using just a sort of guide rail and screw / nut for the adjustment. Simpler than it sounds, but I haven't drawn it up yet. I always tend to over-engineer though. What are you shimming the one side with? Just printing out single layer washers? Gotcha... that'd work. May go that route if this gives me a headache. I need better Solidworks skills. I have it all in my head, but it's hard for me to work out in SW. 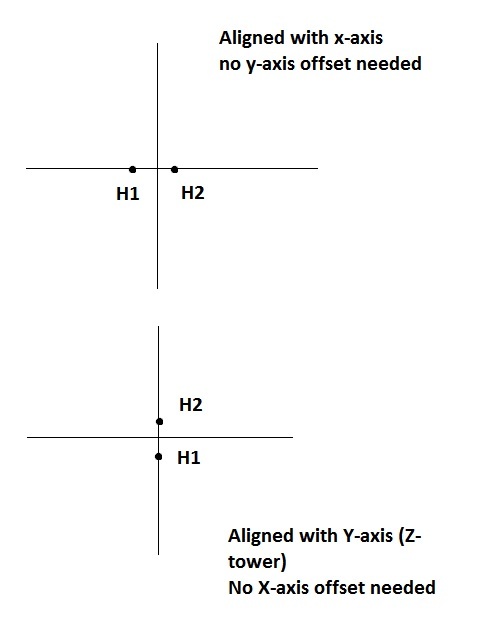 I was wondering, would there be any issue with having the 2 hotends parallel, or rather collinear to the Z-axis? Sorry, I'm a bit confused... Is this how it works? So, if I lined it up with the Z-tower, it would be similar and should work out right? Work in progress... I have no idea if this is going to work, but my V6's are on their way, so I need to get this finished! One of the hotends will be height adjustable by a couple of millimeters (hopefully). Lots to redesign / re-do, and lots more to do, but this is the gist. atoff wrote: Work in progress... I have no idea if this is going to work, but my V6's are on their way, so I need to get this finished! One of the hotends will be height adjustable by a couple of millimeters (hopefully). I agree with McSlappy about using 1 single fan. I had printed and used all three known (by me at least) dual mounts for E3D V5. Among them, dpmacri's version (http://www.thingiverse.com/thing:217662) sports a single fan. It works very well, not over-heating problems at all. Thanks. 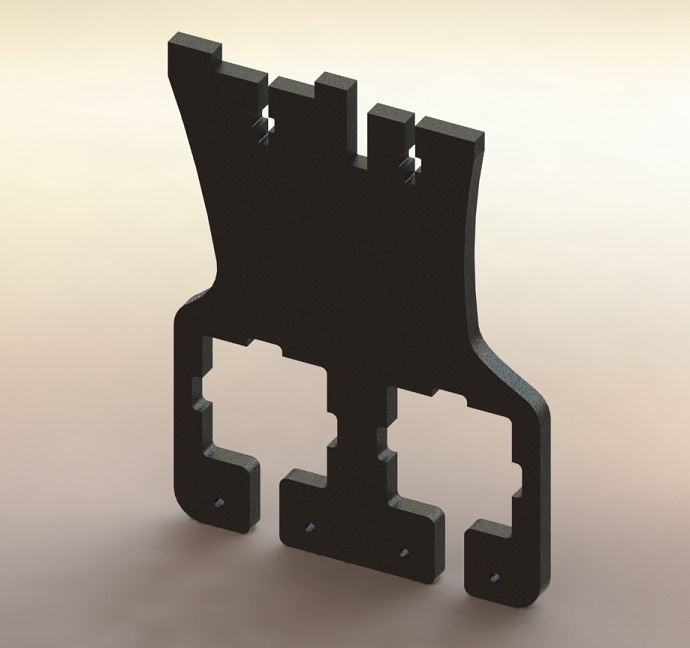 I was thinking about going with a printed fan shroud, that would give a me a way to also attach a layer fan, as I'd be able to design the layer fan into the sides of the shroud, but still thinking about it. I keep changing the design, but the one I have now seems like it's going to work best for making small adjustments. Also, the left side of the lower part is going to be filled in, that indent / degrade is unnecessary and will just make it more difficult to print, it was just done during the initial sketching. atoff wrote: Sorry, I'm a bit confused... Is this how it works? lol Cool. Well, I could try lining it up with the z-axis... for some entertaining results. Wow, glad someone has working proof on that. What size is that fan?